I have to confess that this recipe actually came about by accident. 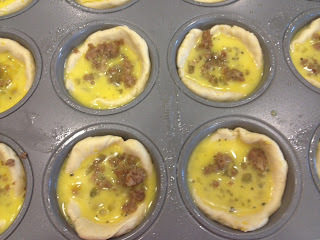 It was a Friday morning and I was planning to make mini-quiche using ready-made biscuit dough for the crusts to bring to work to share with some co-workers. The night before I had inadvertantly bought the Grands biscuits, the kind that puff up quite a bit instead of the regular biscuits. Not realizing my mistake, the next morning I proceeded with the recipe as planned. 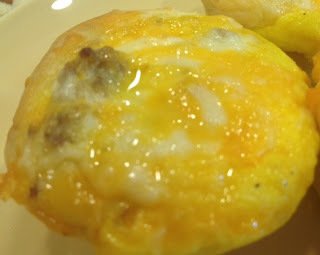 Pulling them out of the oven, I was surprised to see muffins with egg, sausage and cheese in them instead of the quiche I had envisioned. Not having the time (or the ingredients) to remake, I brought them to work anyway and my co-workers loved them! The "mistake", which I didn't own up to at that time, turned out to be a big success. Don't you love it when life works out that way? 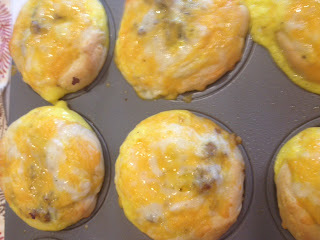 Spray a 12 cup regular size muffin pan with non-stick cooking spray. Set aside. In a small skillet or sauce pan, cook the sausage over medium heat until browned and no longer pink. Remove to paper towl-lined plate to drain. Open the can of biscuits and separate. Cut about 1/4 off of each biscuit. Combine 2 of the scraps together to form 4 additional biscuits. You should have a total of 12 biscuits. Shape each biscuit into a flat disk. Place on a cutting board and using the heel of your hand flatten until they are big enough to fit into the bottom and most of the way up the sides of each muffin cup. Place in the muffin cups. 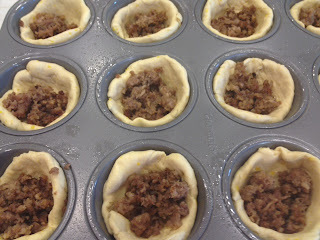 Divide the cooked sausage evenly between the biscuit lined muffin cups. Crack the eggs into a measuring cup. Add the milk, season with salt & pepper and whisk to combine. Pour on top of the sausage, dividing evenly. 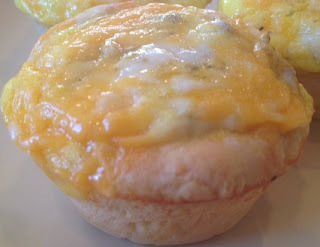 Sprinkle each muffin with cheese. 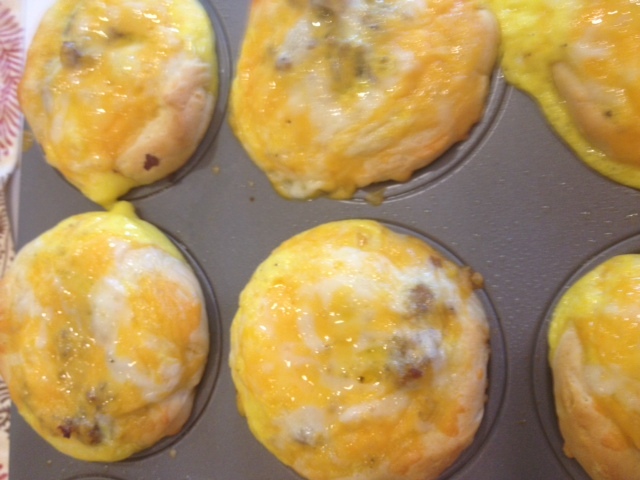 Bake at 350 for approx 20-25 minutes or until the muffins are golden brown and done and the eggs are set. Remove from oven and allow to cool for a few minutes in the pan. Remove from the pan and serve warm. Can be reheated in the microwave for 10-15 seconds. Store covered in an air-tight container in the refrigerator for 2-3 days. Well, Thanksgiving is over and the holiday season is upon us. Were you brave enough to venture out into the crowds and take advantage of the Black Friday deals? Did you eagerly put up your holiday decorations? More importantly, have you used up all of those Thanksgiving leftovers? : ) In my house, we usually don't have too many leftovers, however two things I did have leftover were fresh cranberries and lemons. I wanted to combine them to make something savory since our last post was a cake (thanks Yvonne for the wonderful birthday cake), but I recently saw this great recipe on Pinterest (thanks Pinterest!) and decided to give it a try. 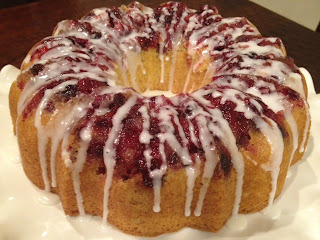 Cranberry Lemon Bundt Cake with Lemon Glaze....yumm. 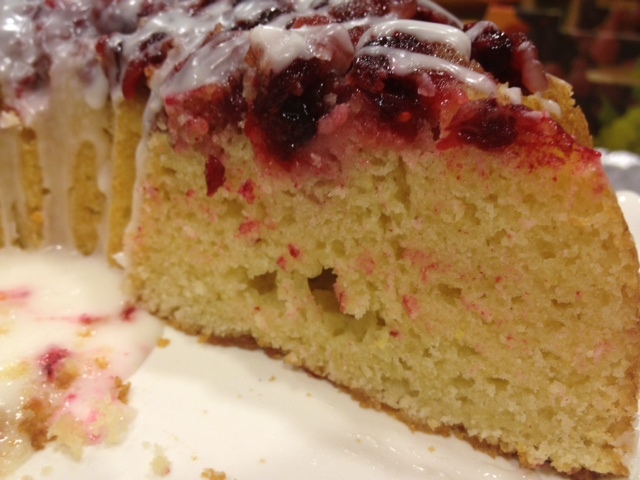 This cake would be great to serve for brunch or as a holiday dessert. 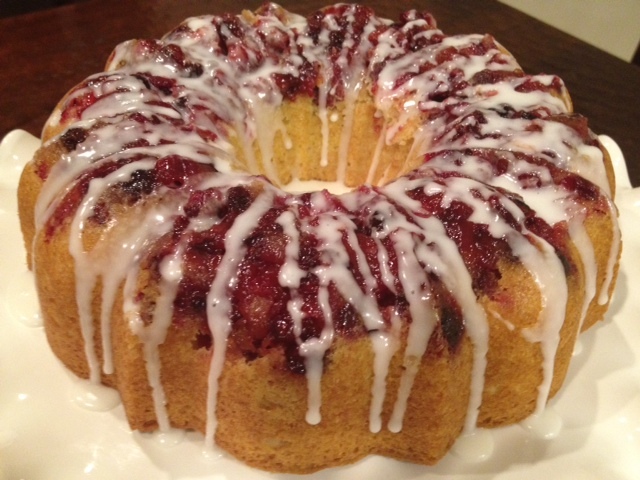 The tartness of the cranberries and lemon blend perfectly with the rich, buttery sweetness of the cake and the glaze (also made with fresh lemon juice and zest) elevates the refreshing lemon flavor. I hope you'll give this recipe a try this holiday season. Generously butter a 12c bundt pan with softened butter. Do not use cooking spray as the butter blends with the brown sugar and adds flavor to the cake. In a measuring cup, combine the buttermilk, vanilla extract and 2 tablespoons of the lemon juice. Set aside. 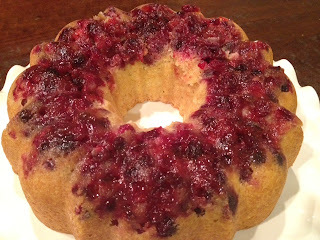 Sprinkle the brown sugar evenly into the bottom of the buttered bundt pan and sprinkle the cranberries evenly over the brown sugar. Set aside. Put the granulated sugar in a large mixing bowl. 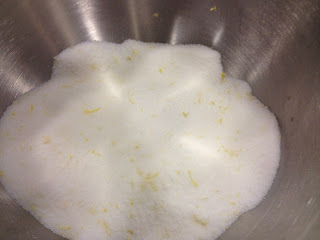 Add the lemon zest and, using your fingers, rub the lemon zest into the sugar until fragrant (approx 30-45 seconds). This process releases the lemon oils from the zest and essentially creates a lemon sugar. Add the butter and cream at medium speed for 2 minutes. 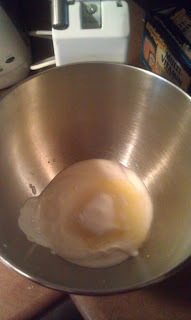 Add the eggs one at a time mixing well after each addition and scraping down the bowl with a rubber spatula as needed. Add 1/3 of the flour mixture, mixing just until combined. Then add 1/2 of the buttermilk, mixing just until combined. Repeat this process adding 1/3 of the flour mixture, mixing until combined, then the remaning buttermilk mixture, then the last of the flour mixture. Mix just until combined at each addition to ensure you do not overmix the batter. 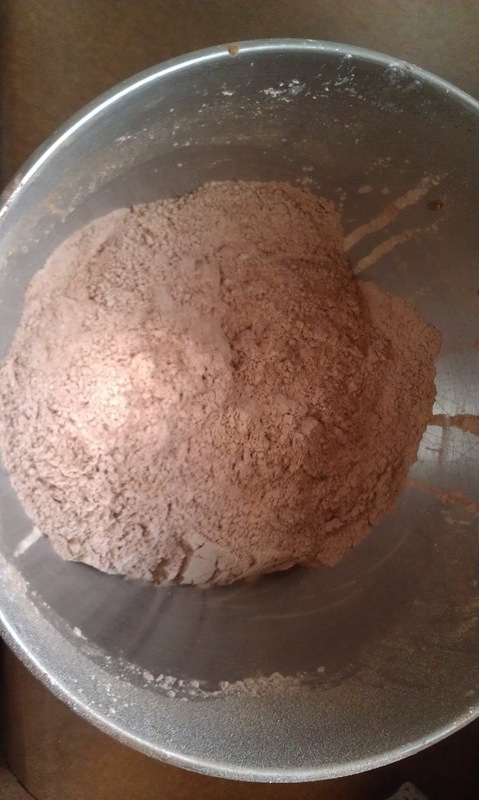 Once the last of the flour is mixed in. Increase speed to medium-high and beat for 2 minutes. Spread the batter into the prepared bundt pan, spreading evenly over the cranberries. 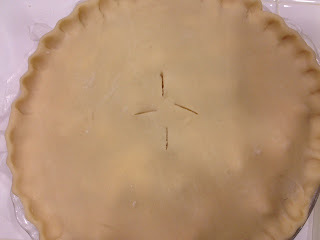 Bake for 30-35 minutes or until a toothpick inserted in center comes out clean. Cool in pan for a few minutes, then invert onto a cake platter and allow to cool completely. While the cake is cooling, make the glaze: Combine the zest of 1/2 lemon, 1 c of the powdered sugar and the remaining lemon juice. Mix until well combined. At this point adjust as needed - if the glaze is too runny, gradually add more powdered sugar a little at a time until the desired consistency is reached. Try not to add too much powdered sugar or you will need to add more lemon juice. 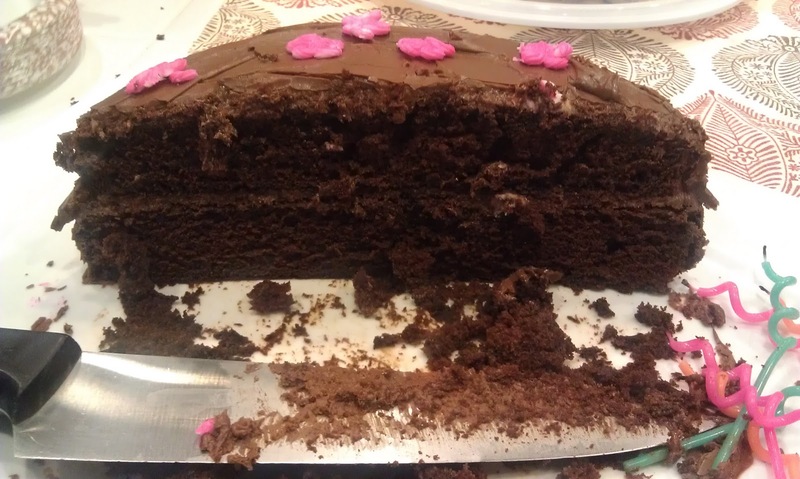 The glaze should slowly and partially run down the sides of the cake (it should not completely slide off creating a puddle at the bottom of the cake). Note: If you do not have buttermilk, you can create "sour milk" by adding 2 teaspoons of fresh lemon juice to the 3/4 cup of milk you need for the recipe and allowing it to sit/curdle for 5-10 minutes. You can also use white vinegar, but I think using lemon juice is better since this recipe already requires fresh lemon juice. I told myself I would start this week blog with this lyric from Gary Allens song, it guess I was being nostalgic about my past and the words really hit home. It was Faye birthday this week. Funny story… her husband Mike planed this great surprise party for her. Faye's sister Freda contacted me to see if i could bake Fayes birthday cake. Of course I said absolutely! Anything for Faye.. you see, sometimes life is not so beautiful, but if you have great friend like Faye it does come out to be a beautiful ride( in our case, with lots of flour and sugar around us ). The funny part of the story is that the week before the party… Fayes mom accidently slipped and let it out about the party. She felt so bad that she slipped that she could not stop laughing. Faye said she hadn’t seen her mom laugh that hard in years J. It actually made Faye happy to see her mom that happy. Some moments in life can be so small yet, so beautiful. For example, the laugh of your mother. Ok, done with the mushy stuff. Now to the good stuff, CAKE!!... Well since Faye knew about her birthday I told her to pick the cake she personally would like to eat, since it was her birthday. So she picked a Coffee-Chocolate Layered cake from Bon Appetit with a Mocha frosting. The cake turned out really good.. moist, not too sweet with a lovely taste of coffee. The recipe is easy to follow and the frosting is basic but delicious. 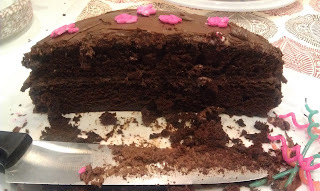 For those coffee and chocolate lovers in your family, I completely recommend this cake. Enjoy! Happy Cooking! Sift 2 cups cake flour, cocoa, baking soda, and salt into medium bowl. Add brown sugar and beat until well blended, about 2 minutes. Add eggs 1 at a time, beating well after each addition. 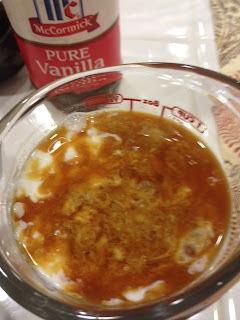 Mix in vanilla. Divide batter between pans; smooth tops. Bake cakes until tester inserted into center comes out clean, about 40 minutes. Cool cakes in pans on rack 15 minutes. Run small knife around sides of pans to loosen cakes, put on cooking rack until completely cool. 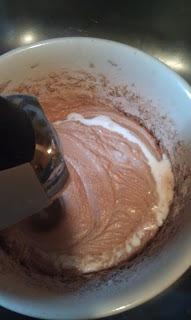 · Combine coffee and cocoa in small bowl of electric mixer. Beat until blended. Add sugar, butter or margarine, salt, and vanilla. Beat until blended. Scrape bowl, and beat icing until it has a spreading consistency. 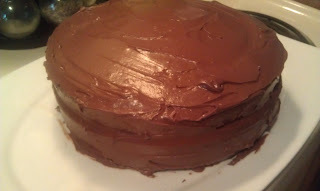 · ( I recommend you double frosting recipe, I felt that you needed more frosting on this cake. If you're like me, you're sitting in front of your computer right now wondering where the month has gone. It's so hard to believe Thanksgiving is almost here. From the looks of the stores (that immediately began playing Christmas Carols the day after Halloween) you would think we've completely skipped Thanksgiving this year. Thanksgiving definitely doesn't get the respect it deserves. I'm looking forward to a few days off, to sitting down to a delicious meal with family, to giving thanks for all of the blessings of the past year. It doesn't feel like Thanksgiving to me if I haven't spent most of the day cooking and baking. We have our traditional dishes we make every year: the boys would be upset if I didn't make Macaroni and Cheese, Chris loves stuffing, my Niece, Mandy, loves Pumpkin Cheesecake and my husband loves everything! My favorite dishes are my Mom's Sweet Potatoes and this Upside Down Apple Pie. I'll never forget the first time I made it. 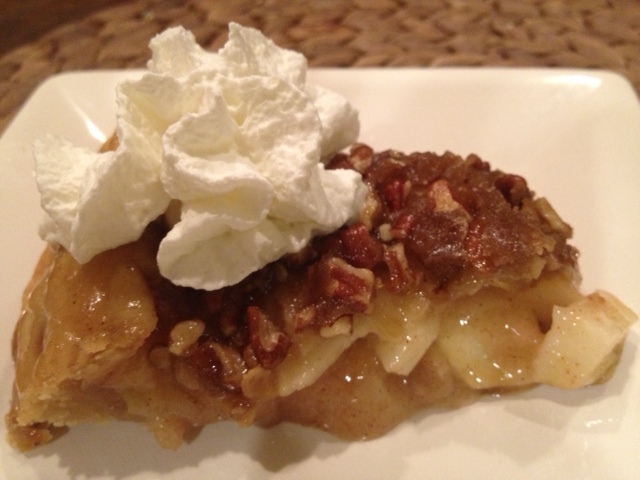 I thought it was one of the best apple pies I have ever eaten and most people who have tasted it agree. I call it "Award Winning" because it won 'Best Taste' in a Bake Off at work. I've only given this recipe out to a few people, but I strongly believe that great food is meant to be shared. So if you want to be the hero of your Thanksgiving dinner, if you want your guests to rave about one of the best apple pies they've ever eaten, then you will make this pie. Follow instructions to bring crust to room temperature. Spray a deep dish glass pie plate with non-stick cooking spray. Line with waxed paper making sure there is at least a 1" overhang. 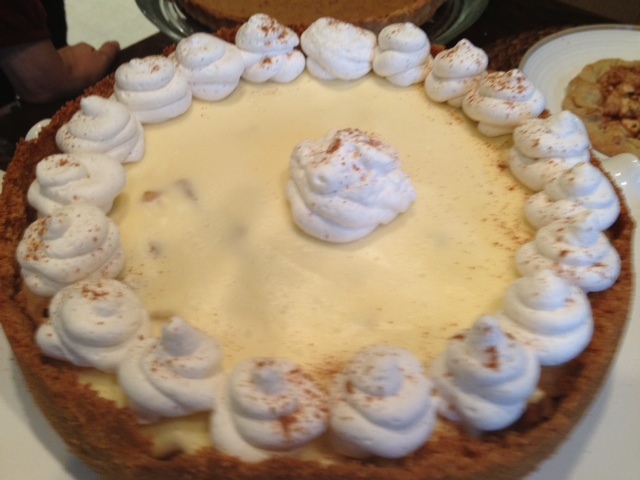 You'll need the overhang to help loosen and remove the pie. Spray the wax paper with cooking spray. 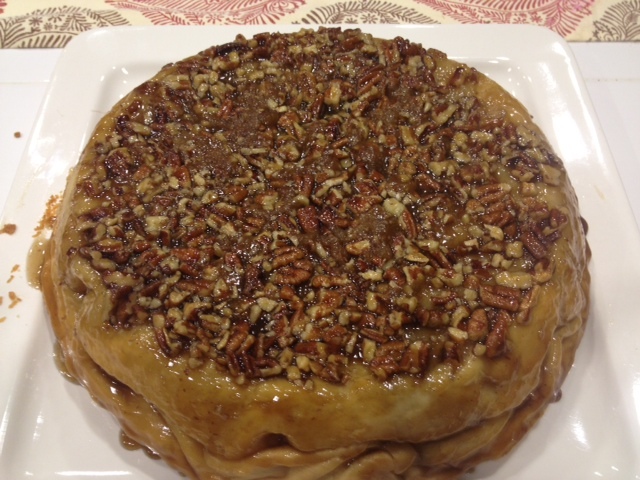 In a small bowl, combine the brown sugar, pecans and 4 tablespoons of the melted butter. Spread evenly into the bottom of the prepared pie plate. Roll out one of the crusts to a size approx 1- 1 1/2" larger than the pie plate. 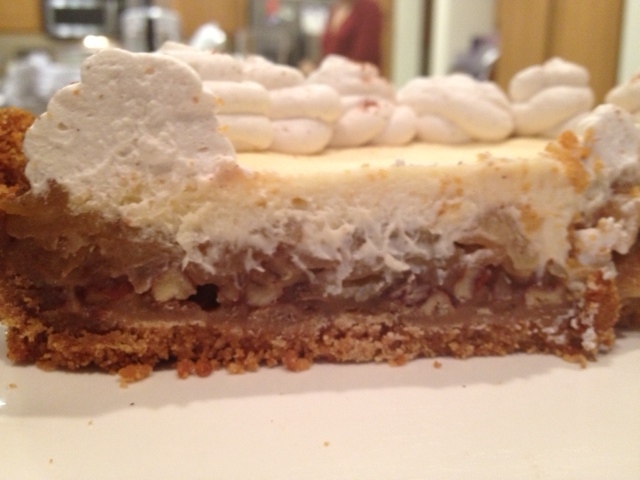 Gently place the crust into the pie plate on top of the pecan mixture and gently press the bottom against the nut mixture. In a large bowl, combine the granulated sugar, flour, cinnamon and remaining 2 tablespoons melted butter. Add the sliced apples and toss to coat. Spoon the apple mixture into the prepared pie plate. 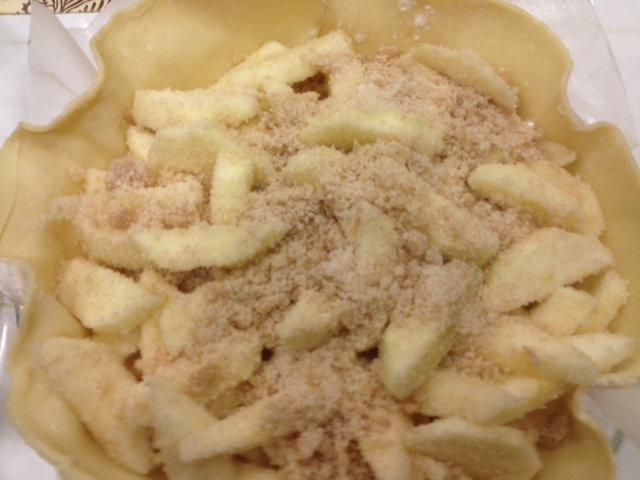 Roll out the remaining pie crust and place on top of the apple mixture. 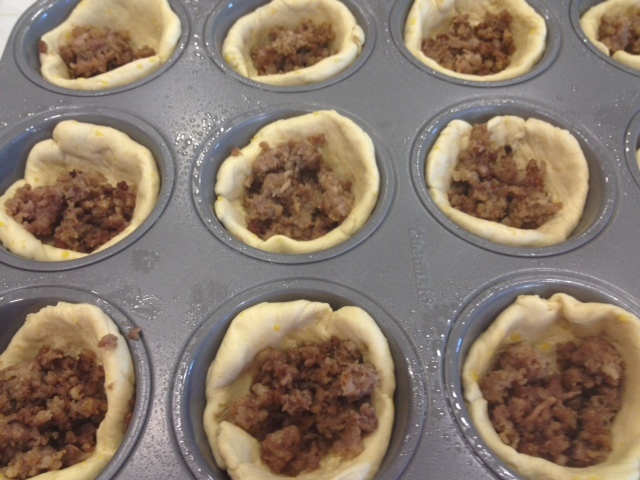 Fold the overhang of the bottom crust over the edges of the top crust and crimp to seal. Cut 3-4 slits in the top of the crust. Place the pie on a baking sheet and bake for 1 hour. Place a foil tent over the crust if it begins to brown too quickly. Careful not to overbake or your apples will turn into apple sauce. Remove the pie from the oven and carefully loosen the wax paper around the edges of the pie. Carefully invert the pie onto a platter. The brown sugar/pecan mixture will be extremely hot. Remove wax paper and allow the pie to cool approx 30 minutes. Cut into wedges and serve warm or allow to cool completely. Store leftovers (if any) covered at room temperature for no longer than 2 days. As a kid, Christmas was my favorite holiday. It was all about Santa and presents, Thanksgiving was just a day to eat turkey and pumpkin pie. It wasn't until we moved to Rota, Spain where my husband served as a Firefighter in the US Navy that my feelings changed. Living on the military base there and being in a foreign country completely changed my perspective. Choices and options were limited compared to the excess of life in America. There was only one clothing store, one grocery store, one school for all ages from Kindergarten all the way through to 12th grade. We met so many people who were away from their families, many who didn't know how to cook. It was then that I began to truly develop my cooking skills and began cooking homemade meals for the single firefighters my husband worked with. They were so thankful for those homemade meals that reminded them of home. At Thanksgiving, we would open our home to these servicemen so they could enjoy a traditional meal. Although our house was small and would be crammed full of people, no one complained. Everyone was thankful for the delicious food, the friendship and comraderie. Watching the look of appreciation on everyone's faces as they enjoyed the meal I made and hearing them give thanks for life's blessings even though they were far from home and away from those they loved was a rewarding experience. It was then that Thanksgiving became my favorite holiday. No matter how you spend your Thanksgiving, I hope you are surrounded by those you love and I hope your blessings are too many to count. Well it was definitely a fun-filled weekend! Faye and I were finally able to get together to cook and test out some new recipes. I showed up at Faye's house an hour earlier than expected. 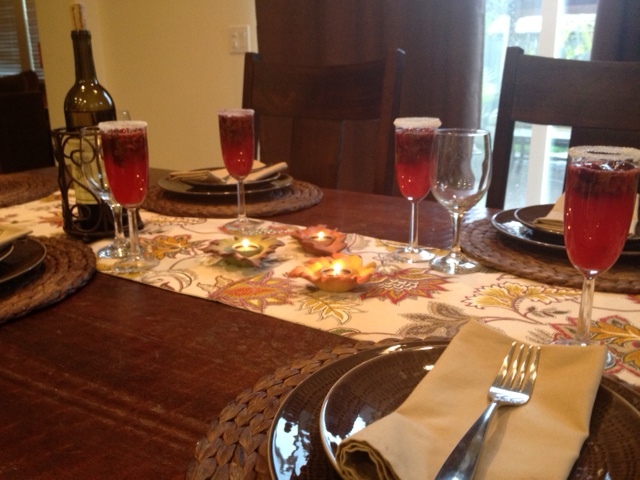 I guess I was excited to start cooking : ) We couldn't have picked a more beautiful Fall day to be in the kitchen. It was pouring rain outside, grey and chilly. Since Thanksgiving was on our minds, we stuck to the basics, Turkey, Stuffing, Green Beans, Potatoes and dessert! We incorporated all of the traditional Thanksgiving flavors but with a twist. I'm sure many of you cooks out there have the same dilema that Faye and I have....our families hate any changes to the traditional dishes they enjoy on Thanksgiving and Christmas. So Faye and I decided to use this day to try out new recipes that we both personally would like to see at our Thanksgiving tables but would never be able to thanks to our stubborn families : ) The funny part was Faye's boys loved the new dishes once they tried them! 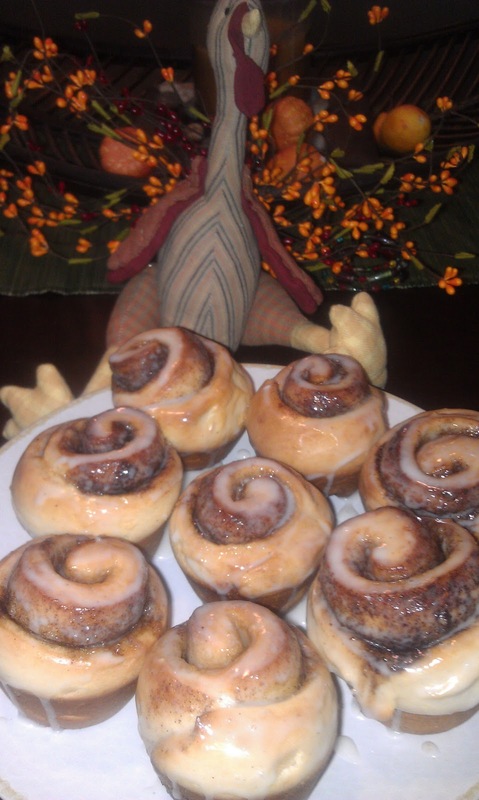 They even said they wouldn't mind having them again on Thanksgiving, HA! I wish my sisters would have been there to try out these great new dishes. 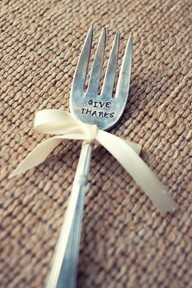 Maybe they also would have loved to have these new options at our Thanksgiving table! I hope you have an open-minded family willing to try out these new recipes. Maybe they can become new traditions at your Thanksgiving table. If not, do what Faye and I did...create your own Thanksgiving on a rainy Saturday afternoon and try out anything new you want to. 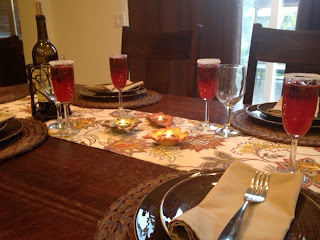 Happy Thanksgiving from LiveBakeLove where love is always our main ingredient! With a serrated knife, cut 1/2 of the baguette on the diagonal into 1/2" thick slices. Brush with olive oil and sprinkle with salt and fresh cracked pepper. Place on a baking sheet and bake at 375 for approx 5 minutes or until toasted. Remove from oven and set aside. In a skillet over medium heat, heat olive oil until hot. Add the scallions and cook until softened. Add garlic and cook for 30 seconds. Add the mushrooms, salt and pepper and cook, stirring occassionally for 5 minutes. Add remaining ingredients and cook, stirring occassionally, for 3 minutes. 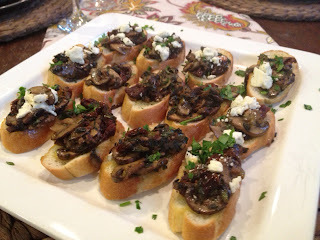 Spread onto the prepared crostini, top with feta cheese and return to the oven for a few minutes to warm up the cheese. Place on a platter and garnish with additional parsley. Serve warm. 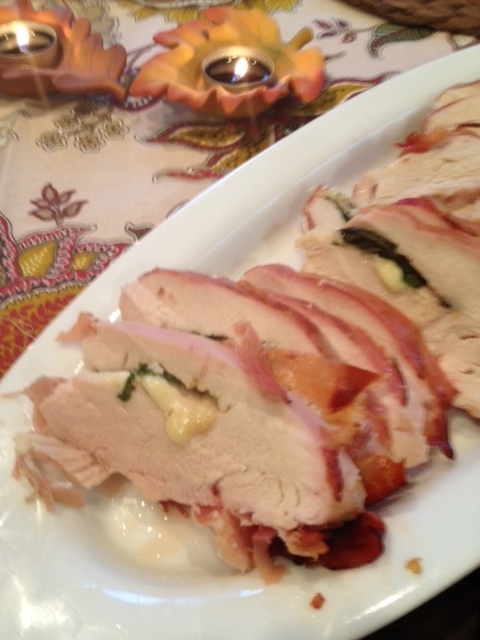 Make a large pocket like slit in each turkey breast half and unfold like a book. Sprinkle with salt and pepper. 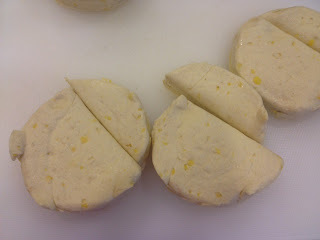 Remove the rind from the brie and slice into 1/4-1/2" thich slices. 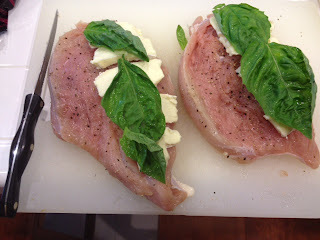 Place a few basil leaves on top of the brie to cover. Fold the other half of the breast over the filling. Loosely wrap the prosciutto around each turkey breast (I needed about 3 slices of prosciutto for each breast). Place in a small roasting pan on a rack (I used whole carrots and celery to form a rack). Place in the oven and roast for approx 35-45 minutes. The turkey is done when a meat thermometer inserted in the thickest part of the meat registers 160F. Remove from oven, tent with foil and allow to rest for 10-15 minutes. The temperature of the meat will rise approx 5F during the resting process. Place on a cutting board and with a sharp carving knife, slice on the diagonal into 1-1 1/2" thick slices. Place on a platter and serve warm. ** I recommend making a quick pan sauce with the pan drippings. Place sliced mushrooms on a baking sheet. Toss with canola oil and 1/4 tsp salt. Roast for 20 minutes, stirring halfway through the process. Remove from the oven when mushrooms are deep brown. Set aside. In a large skillet, brown the sausage over medium heat. Remove sausage from skillet and set aside. Add diced onions to the skillet and brown for 5 minutes. Increase heat to high and add apples, brown sugar, 1/4 tsp salt. Cook for 3-5 minutes or until deep golden brown. Decrease heat to medium and pour in the wine. Stir and cook until liquid is reduced by half (about 2-3 minutes). Pour the apple/onion mixture in a bowl and set aside. Add the chicken broth to the skillet and add the thyme, tumeric, rosemary salt and pepper. Stir and cook until warmed through. Set aside. Put the cubed bread in a large bowl. Add the sausage, the apple onion mixture along with it's juices and the mushrooms and cranberries. Toss to combine. Add about 3/4 of the broth mixture (be sure to give the broth a good stir before adding to redistribute the spices). Toss to coat. If more moisture is needed, add more of the broth mixture. Keep in mind you might not need to use all of the broth mixture, the moisture level is up to you. Add the chopped parsley and toss to coat. Taste the mixture for seasonings and adjust as needed. Preheat oven to 375. 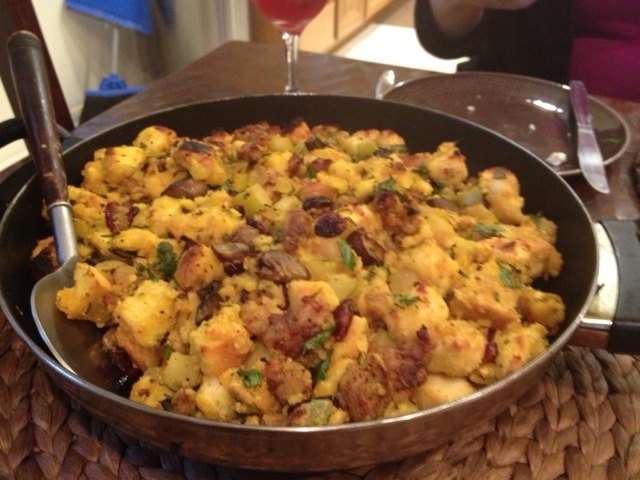 Place mixture in a skillet or baking dish and bake covered for 20-25 minutes. The dressing is ready to serve at this point or you can uncover, return to oven and allow the top to get browned/crispy if desired. Place the flour, salt and sugar in the bowl of a food processor and pulse a few times to combine. 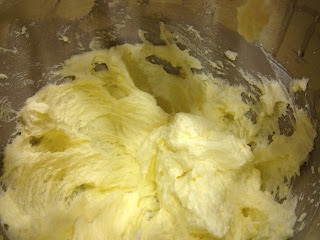 Scatter the cold butter pieces over the flour and pulse about 15 times until the mixture resembles course meal. Transfer to a large mixing bowl. 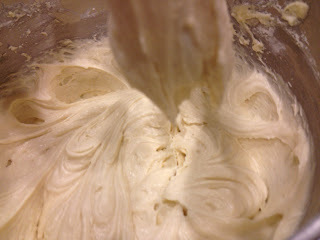 Whisk together the eggs, cornstarch and vanilla and pour over the flour mixture. Toss with a rubber spatula until the dough begins to stick together. Using your hands, knead the mixture very briefly to bring the dough together. 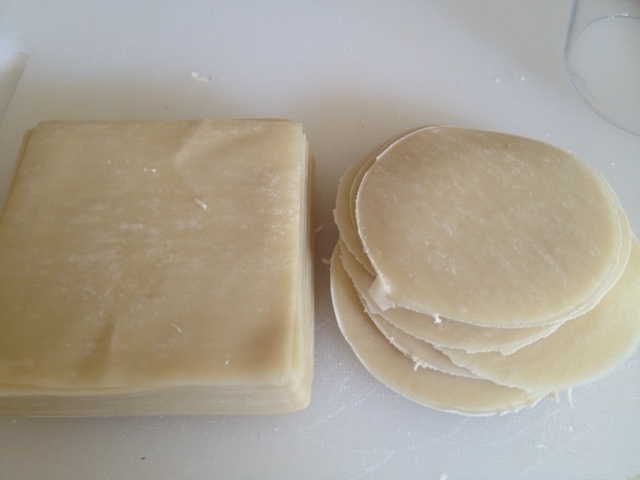 Place on plastic wrap, form a disk and refrigerate for a minimum of 2 hours or up to 3 days. Preheat oven to 425. Remove the dough from the refrigerator and place on a generously floured surface. Sprinkle a small amount of flour on top of the dough. 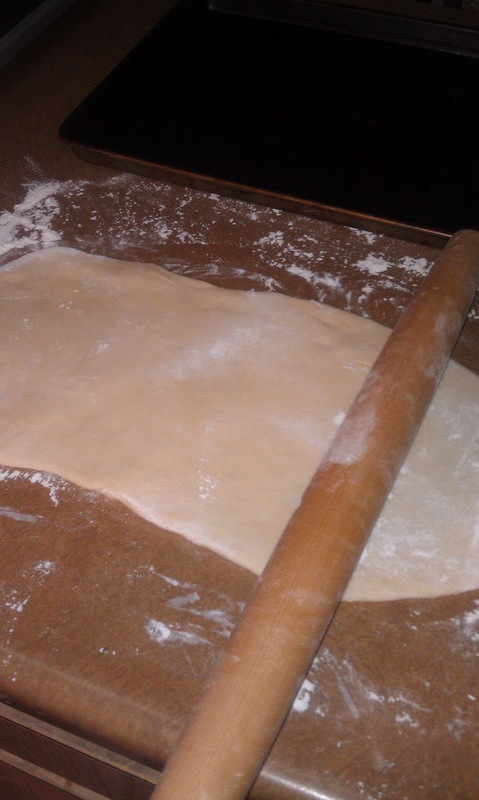 Using a rolling pin, roll the dough out to form a circle approximately 11". 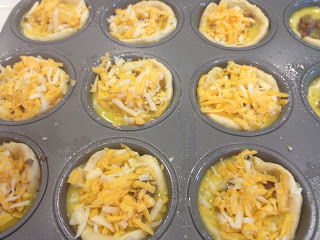 Fit the dough into the tart pan with removable bottom, prick the bottom with a fork, line with aluminum foil and fill with beans or pie weights. Bake for 20 minutes. Remove the foil and beans/weights, reduce temperature to 350 and bake for a few minutes more until the crust is golden brown. Remove from oven to cool. Place the cream and chopped chocolate in a microwave safe bowl and microwave on high for 1 minutes. Remove and stir well to combine and melt the chocolate. If the chocoalte is not melting into the cream, return to microwave for an additional 30 seconds and stir again. 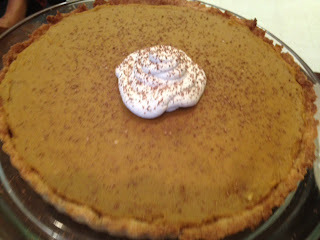 Pour the chocolate onto the bottom of the crust and spread carefully in an even layer. Cool until set. 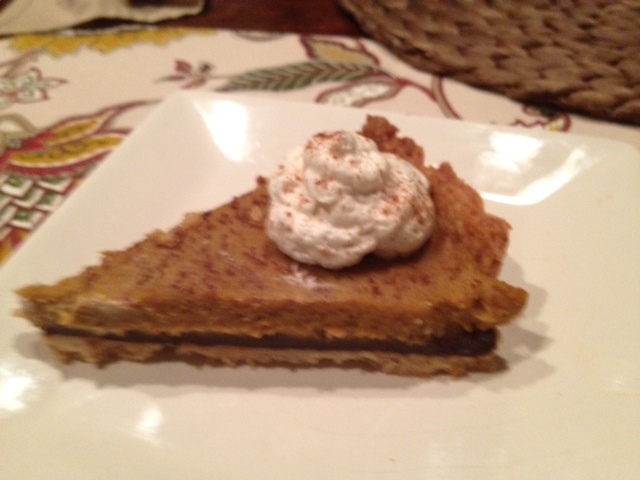 Combine the pumpkin, sugar, cinnamon, allspice, cloves, nutmeg and heavy cream in a medium saucepan. Cook over medium heat, stirring frequently, until hot but not bubbly. Whisk the eggs with the cornstarch and add to the saucepan. Continue cooking, stirring constantly until thickened and bubbly. Remove from heat and cool to room temperature. Pour the cooled filling into the tart shell and smooth the top with a rubber or offset spatula. Refrigerate for a few hours or until firm. In the bowl of an electric stand mixer fitted with whisk attachment, beat the heavy cream on medium speed until it begins to foam. Add the cinnamon, vanilla and powdered sugar. Increase speed to high and beat until desired consistency (soft or stiff peaks). To serve the tart: Garnish with Cinnamon Whipped Cream and drizzle with melted chocolate if desired. Store leftovers covered in the refrigerator up to 2 days. Preheat oven to 375. In a medium bowl combine the graham cracker crumbs, sugar, cinnamon and melted butter. Toss with a fork to combine. Press into the bottom and 1" up the sides of an 8' or 9" springform pan. Bake for 6-8 minutes or until golden in color. Let cool 10 minutes. 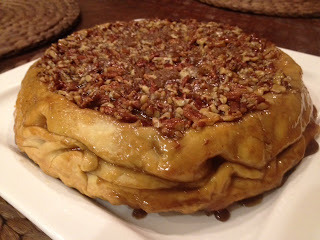 Pour the caramel on top of the crust and sprinkle with the chopped pecans. In a large skillet over medium heat, melt the butter. Once the butter has melted add the brown sugar, salt and cinnamon and cook for 1 minute or until bubbly, stirring occassionally. Add the apples and mix to coat. Cook over medium to medium-high heat until the apples are tender and most of the liquid has reduced (about 15 minutes). 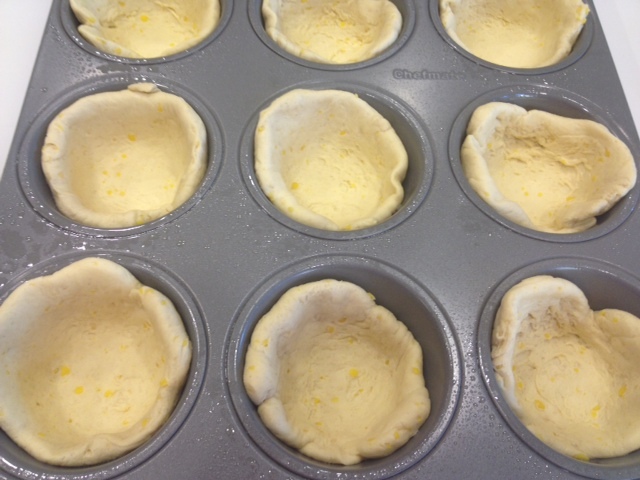 Let cool for a few minutes and then pour into the bottom of the prepared pie shell. In a large bowl, with an electric mixer, beat the cream cheese and sugar until creamy and well combined with no lumps. Mix in the vanilla, egg and lemon juice until combined. 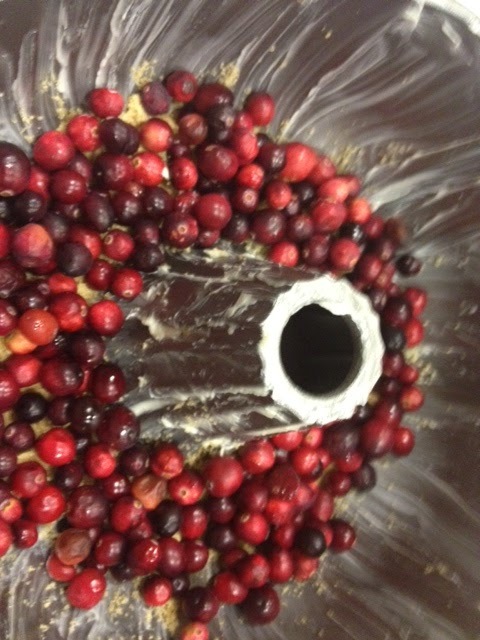 Pour over the apple filling and spread evenly. Bake at 350 until the filling is set (appeox 20-30 minutes). Remove from oven and allow to cool to room temperature. Refrigerate for a minumum of 4 hours or overnight. Before serving, make the Cinnamon Whipped Cream (directions above). Remove the sides of the springform pan and decorate/garnish with the whipped cream as desired. Store any leftovers covered in the refrigerator for up to 2 days. Who would have thought you could serve lasagna as an appetizer? 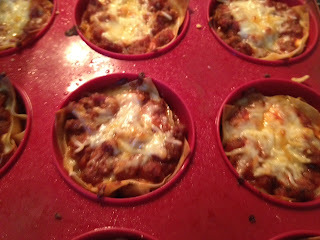 No dealing with large casserole pans, no messy looking servings, just a neat little individual size portion of lasagna. The concept of lasagna "cupcakes" is nothing new, but I've developed a recipe that's more flavorful by using a combination of ground beef and italian sausage and adding herbs to the ricotta cheese. The wonton wrappers "mimic" lasagna noodles but are more tender which is ideal for this type of dish. 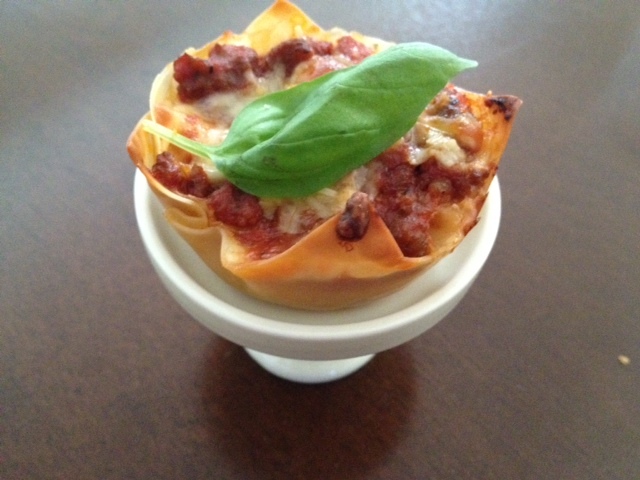 So the next time you want an easy, elegant and delicious appetizer, I hope you'll surprise your guests with these lasagna "cupcakes". You will not be disappointed. Spray two 12 cup muffin pans with nonstick spray. Set aside. Using the opening of a standard wine glass the same approximate size as the muffin cups as your template, place the glass on top of a wonton wrapper and trace around the opening of the glass. Repeat this process with a total of 24 of the wonton wrappers. Leave the remaining 24 wonton wrappers intact (whole). In a medium saucepan, brown the ground beef and italian sausage until no longer pink. Drain. Add marinara sauce and simmer covered for 10 minutes, stirring occassionally. Remove lid and simmer for a few minutes more to thicken slightly. Remove from heat. In a small bowl, combine the ricotta cheese with approx 1/2 tsp of oregano and 1/2 tsp of the italian seasoning. Tip: Be sure to crush the dried seasonings in the palm of your hand or between your fingers before adding it to the bowl with the ricotta cheese. This helps to release/revive the flavor of the dried herbs. To assemble the lasagnas, gently press a whole/uncut wonton wrappers into the bottom of each muffin cup being careful not to tear them. Add approx 1/2 tsp of each cheese (parmesan, ricotta mixture and mozarella). Top with a spoon of the meat mixture (approx 1-1 1/2 tablespoons). 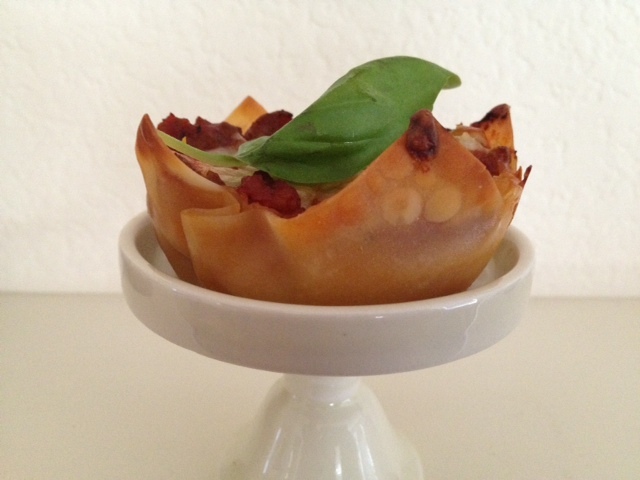 Place a round wonton wrapper on top of the meat. Repeat the layering process with the cheese ending with the meat. Top with more parmesan and mozarella. Bake uncovered for appprox 15-18 minutes or until bubbly and the edges are browned. Remove from oven and allow to cool for 5 minutes. Using a sharp pairing knife, work your way around the edges of each lasagna to loosen, then remove from the pan. To garnish - place a whole basil leaf on top of each cupcake (or if preferred, chiffonade the basil and sprinkle a little on top). Note: This recipe can be customized according to your taste. Add chopped parsley to the ricotta mixture. Try using Italian Turkey Sausage, smoked gouda or provolone cheese. The amount and type of meat and cheese you use is entirely up to you! 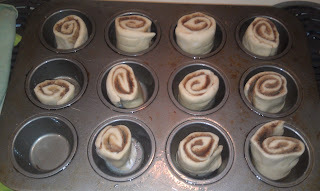 Hello Everyone….So its Rainy and cold this morning in San Diego, California, perfect weather for homemade cinnamon buns. For me, the smell of cinnamon reminds me of a nice fire and being snuggled under a thick blanket while my mom is making Chocolate de la Aguelita while I wait to see what she baked in the oven. Hmmmm… yummy… I do not think Faye and I have mentioned it, but we have both been blessed with amazing mothers that can cook. Faye's mom makes amazing Filipino food from her heritage and then learned to cook Southern food for her husband since he was from the South. If you ever get lucky enough to be in invited to her table (like me J ), you get to eat crunch, savory Lumpia and have Southern buttery peach cobbler!! As for my mom, her Mexican food speaks for itself. I do not think I have been to any Mexican restaurant in the US or Mexico that can compete with her cooking. My favorite being her Chicken Sopes with the homemade sope shell and Peach empanada, in which she makes the pastry and the jam from scratch. Honestly, I do not think I will ever be as good a cook as my mother, but the skills I have gained from her I will have for the rest of my life J….see what rainy weather does to us Californians, we get nostalgic. 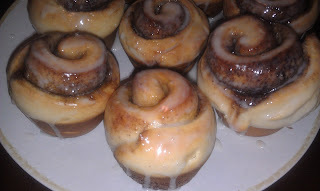 Now back to my Sour Cream Cinnamon Buns… let's just say they are so good that I ate one without icing and the second one after I put the icing on. 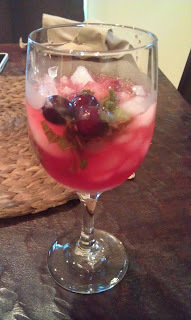 I do not know where I got this recipe from except to say it came from a magazine about 8 years ago. I hope you guys really give this recipe a try as the holidays approach, your family will be knocked off their feet 1. That you made them homemade cinnamon rolls and 2. That they taste so damn good! Happy baking everyone! · Heat sour cream in small sauce pan over medium low heat. · Combine warm sour cream, 2 tablespoons butter, 3 tablespoons sugar, salt and baking soda in a large mixing bowl. Add egg and yeast: blend well. 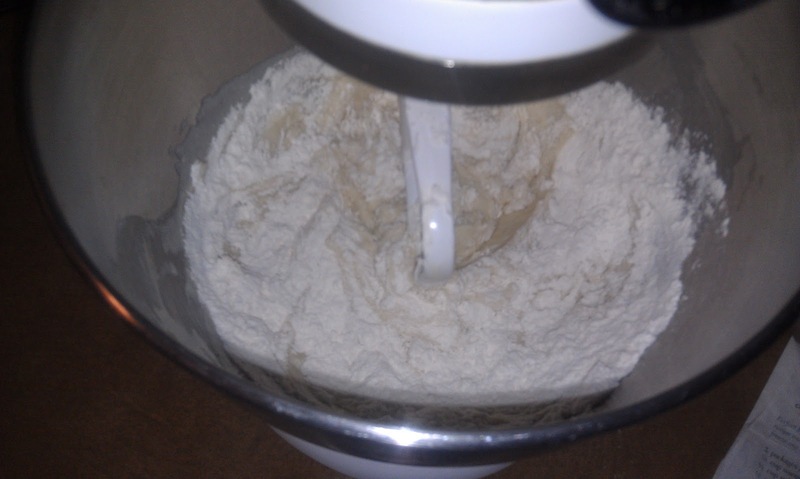 Add 1 ½ cups flour; beat at medium speed with a electric mixer until well blended. 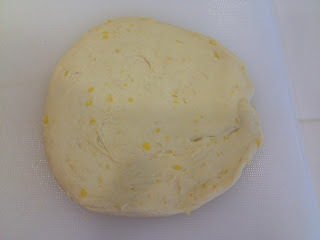 Gradually stir in enough remaining flour to make a soft dough. 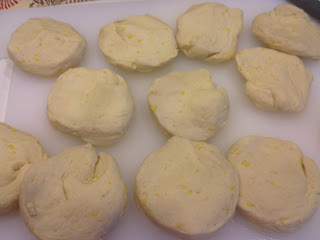 Roll dough into an 18x6- inch rectangle; spread 2 tablespoons softened butter over dough. Sprinkle brown sugar and cinnamon over dough. Roll up dough, starting at long side, pressing firmly to eliminate air pockets, pinch seam to seal. · Bake at 375 degrees for 12-15 minutes or until golden. 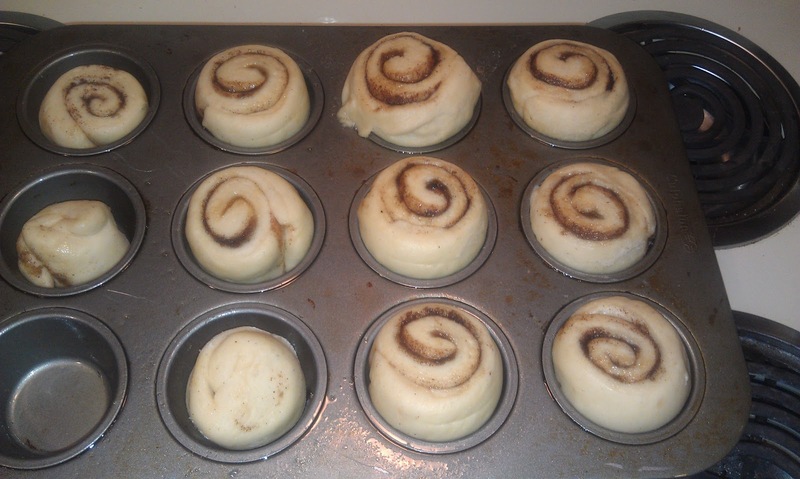 · Remove buns from pan immediately: let cool on wire rack. Combine powdered sugar and milk; drizzle over buns.